When you include the Rolling Dog Farm in your estate planning, you ensure that disabled animals like blind Emmy Lou can live secure, happy, love-filled lives. When blind Emmy Lou was rescued from the wire pen where she had spent her entire life, she was too terrified to even walk. No one ever let this dog out to play, no one ever petted her, no one even cleaned out her cage. Imagine how different life must have been the day she arrived at the Rolling Dog Farm. Instead of living in filth, Emmy Lou was surrounded by open pastures, mountains, and fresh air. She now has a loving home, with plenty of food, a warm and clean bed, and lots of doggie companions. She bounds across the securely fenced play yard like an antelope, never mind that she can’t see any of it. We don’t know if she remembers back when she was too scared to walk, but we sure can tell that the she’s not afraid of anything now. If she could talk, Emmy Lou might tell us that a lot of good can come from a little security and peace of mind. Instead, she gives us a five-foot leap into the air and sprints across the meadow, just for the fun of it. 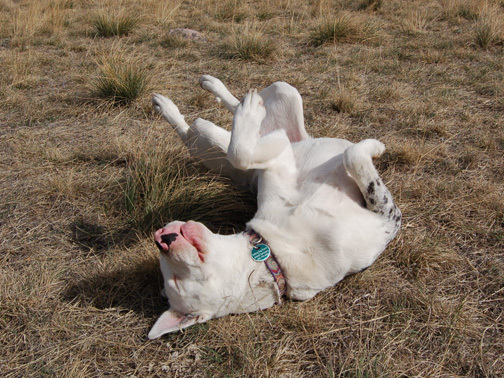 Then she finishes with a flourish by rolling around on her back in the grass with pure joy. Planned giving is one way to provide that same sense of security and peace of mind for ourselves and our families, as well as to leave a legacy that will help make a difference after we’re gone. Including the Rolling Dog Farm in your estate plans means you can take advantage of special tax deductions and incentives that will in turn also benefit your loved ones. You’ll also be helping some very special animals. Contact your attorney or financial planner to learn more about the options for planned giving. You’ll find your own peace of mind, knowing that you will be providing for your loved ones and helping disabled animals. You might not be able to do a five-foot leap in celebration, but Emmy Lou would be happy to do one for you. There are many options for planned giving, and we can’t summarize them all here. Nor should this information be considered legal or financial advice. Contact your attorney or financial planner to learn more about the wide variety of ways you can support the Rolling Dog Farm through planned giving. Bequests, or gifts in your will, are what most people think of when they hear about estate planning. A bequest is one of the simplest ways to make a gift from your estate. You can make a bequest in a variety of ways, including a gift of a specific amount, a percentage of your estate, an item or piece of property, or the amount that remains after you have provided for your loved ones. Bequests are deductible for federal estate tax purposes, and are usually not subject to state inheritance or estate taxes. Contact your attorney to learn more about including the Rolling Dog Farm in your will, and which options will work best for you and your family. A gift through your life insurance policy is another simple way to make a charitable gift. You may have a life insurance policy that is no longer needed to provide for your family or for other expenses. You can name the Rolling Dog Farm as a beneficiary of your policy, or you can make a gift of the entire policy. Tax advantages vary. Your attorney and your insurance agent can help you get started with a gift through your life insurance policy. Like a life insurance policy, the Rolling Dog Farm can be named as the first or second beneficiary on your retirement account. Heirs other than your spouse pay significant income taxes on inherited retirement funds. Making a contribution from these funds can help limit the amount of tax owed by your heirs, and can also maximize your charitable gift. Since taxes have not yet been paid on your retirement account, and you can make a tax-free donation of these funds, you may be able to give a larger gift from your retirement account than you would otherwise. A charitable remainder trust, or CRT, is an arrangement in which a donor’s assets provide a regular income stream to the donor, until that income is no longer needed. The assets of the trust are then passed on to a charity like the Rolling Dog Farm. Tax advantages for CRTs include a current charitable deduction for the donation and no upfront capital gains tax is payable at the time of contribution of appreciated property. Do I have to be wealthy to leave a legacy? Almost anyone can make a charitable gift through estate planning. Most people have an estate of some kind when they die, even if they are not wealthy. Planned giving is an opportunity to give more and make a greater impact in the long term than you may have been capable of during your lifetime. Including the Rolling Dog Farm in your will or giving through your life insurance policy or retirement account are all wonderful ways to support the care and love of disabled animals, even if your current resources are limited. Is it important to designate my instructions in a written will? Your wishes for your estate must be recorded in a will to ensure that they will be carried out properly. Neither the state nor your family will be able to carry out your wishes without proper, legally binding written instructions. There are many important reasons to have a will?making a lasting charitable contribution from your estate is just one of the important decisions that should be made now. Don’t I want my heirs to receive my estate? Many people want to use their estate to provide for their loved ones. Planned giving is a way to ensure that your heirs fully benefit from the resources you’ve built over a lifetime. Estate and capital gains taxes can significantly reduce the total amount of an inheritance. Making a charitable gift through your estate can actually decrease the taxes paid by your estate. Your attorney can give you more information about the tax advantages made available through planned giving. Thank you for thinking about donating to Rolling Dog Farm!